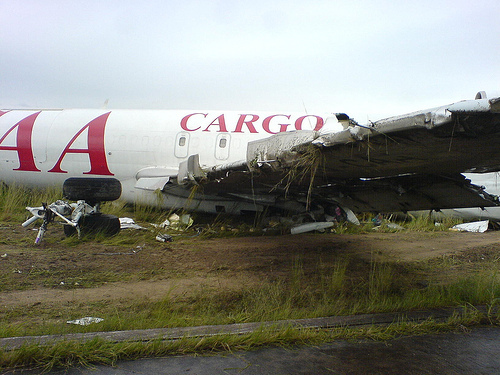 A Boeing 727, operated by Compagnie Africaine d'Aviation - CAA, sustained substantial damage following a runway excursion on landing at Kinshasa-N'Djili Airport (FIH), D.R. Congo. The airplane reportedly landed in very heavy rain and substantial standing water on runway 06 and slid off the side of the runway. It was suspected that improper removal of the tailskid following a landing incident on December 31 caused a loss of hydraulic pressure shortly after takeoff. The flight circled the field for two hours before they carried out n emergency landing.